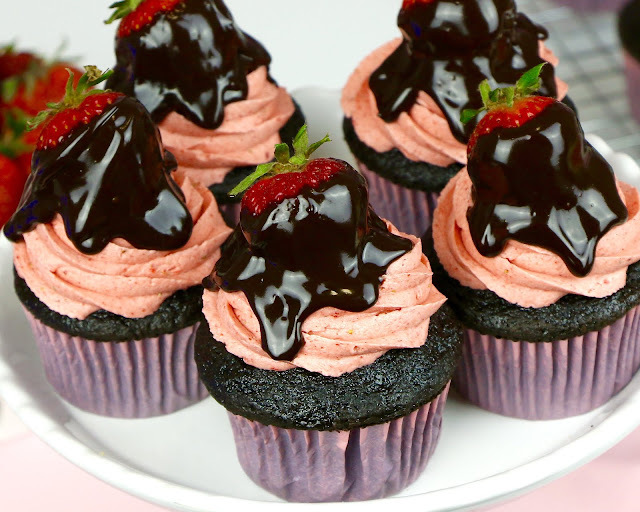 Moist, fudgy chocolate cupcakes, topped with smooth, creamy strawberry frosting and a fresh juicy strawberry, dripping with ultra rich, ooey, gooey chocolate ganache. 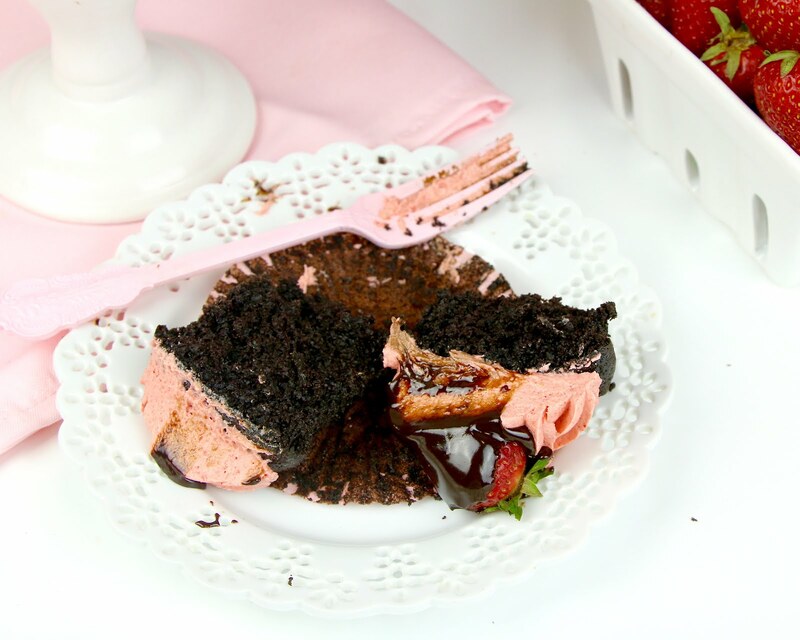 These cupcakes are the ultimate way to enjoy chocolate covered strawberries. And what better way to eat strawberries, that smothered in the most decadent chocolate coating ever?! 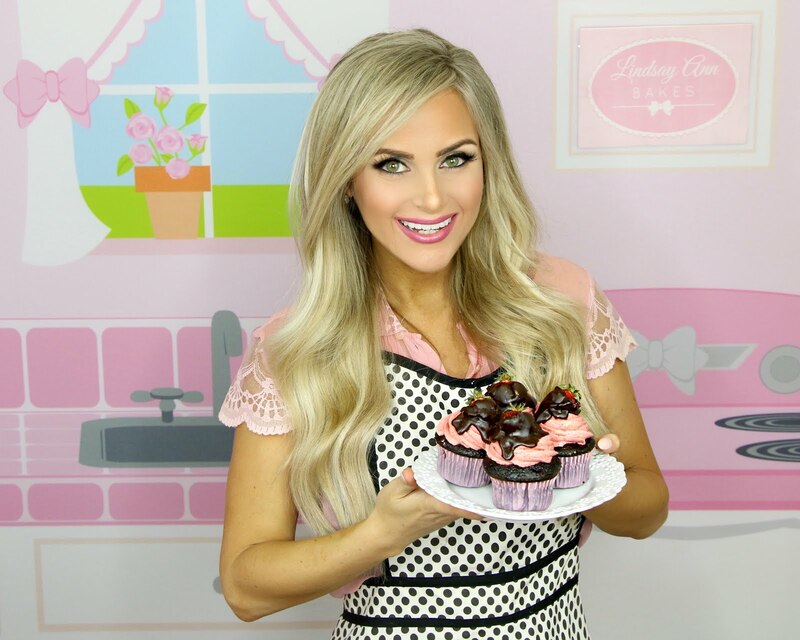 These cupcakes are perfect for Valentine's Day, an anniversary, or any special occasion. 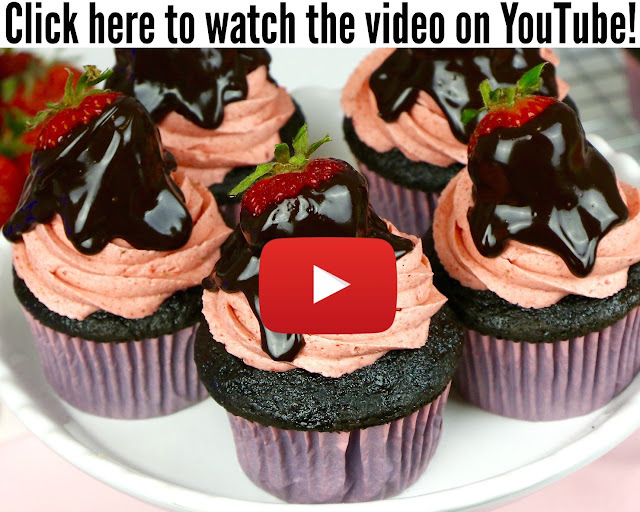 I used my favorite chocolate cupcake recipe for these, because it is super moist, soft and packed with deep chocolate flavor. Best of all, it is super simple to whip together! 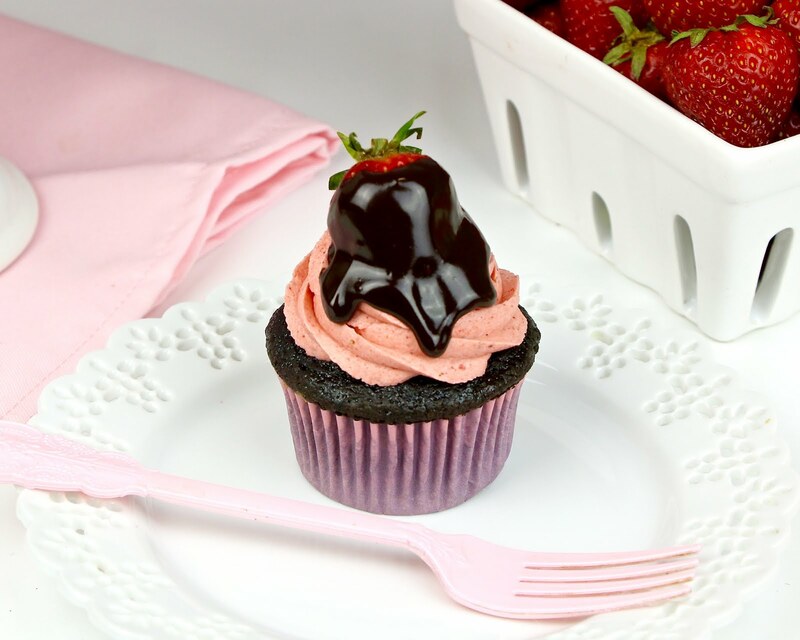 Piled high, is a pretty swirl of sweet and creamy, strawberry frosting that just melts on your tongue. 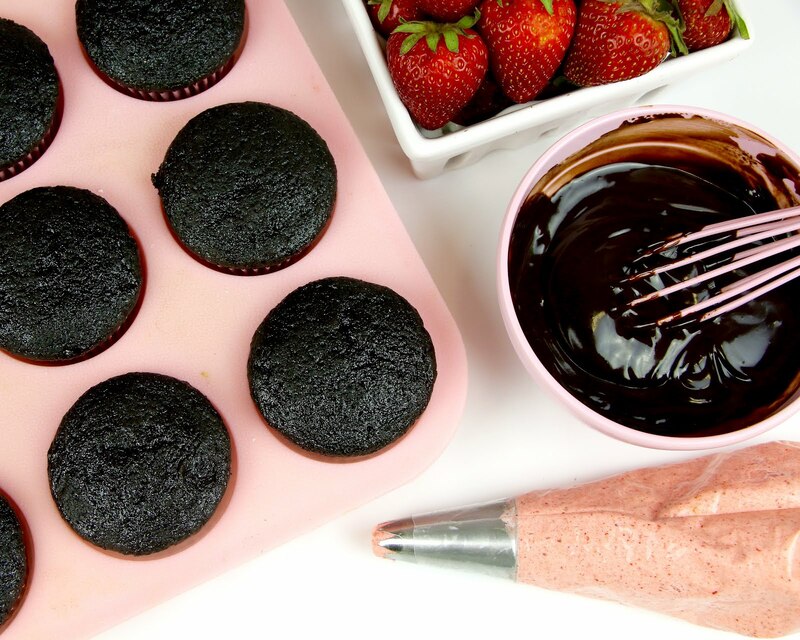 To create an all-natural strawberry flavor and pretty pink pop of color, I added my secret ingredient, a bag of freeze-dried strawberries that I crushed in into a powder, to add to the frosting base. 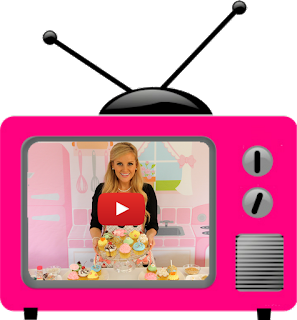 This way, we get a pink frosting, without any food coloring and a powerful punch of strawberry flavor, without watering down our frosting with all the juices from fresh strawberries or added sugars from jam. 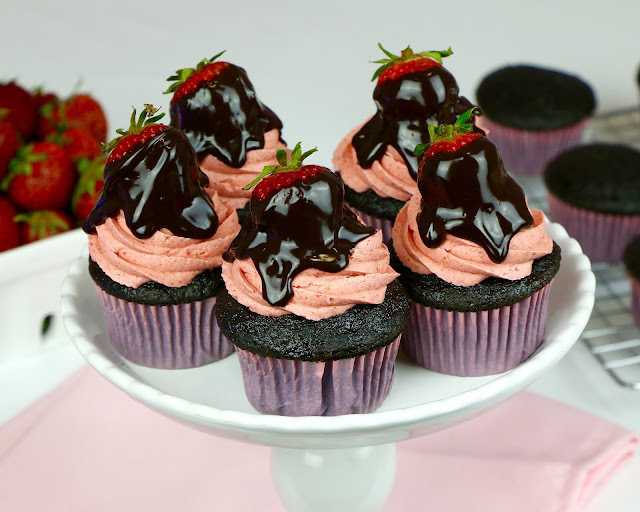 The finishing touch to these cupcakes is a fresh, juicy strawberry, dipped in a bowl of thick, shiny ganache, made of just chocolate chips and cream. I like adding the cream to the chocolate, to create a chocolate ganache, instead of dipping the strawberries in the plain melted chocolate, like usual, because it creates an ooey, gooey, soft chocolate coating that you can sink your teeth into, instead of a hard crunchy shell. This way, it still holds it shape and isn't too thin or liquidy, but is soft enough to pull off the top and take a big bite. 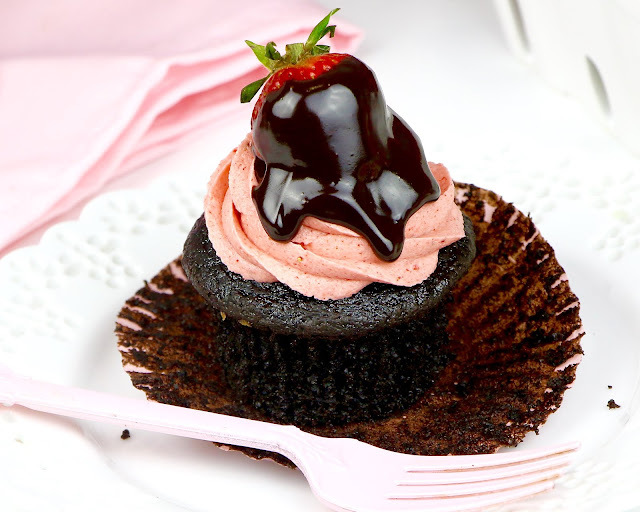 My favorite part is spooning some extra ganache over the strawberry, so the smooth, glossy chocolate, slowly drips down the frosting, creating a totally irresistible cupcake, with an extra indulgent treat on top. Pulse freeze dried strawberries in a food processor or high speed blender, until it turns into a powder (or crush in a resealable bag with a rolling pin until you have a fine powder); set aside. With an electric mixer, beat the softened butter on medium-high speed until light and creamy, about 2-3 minutes. Beat in vanilla, salt and strawberry powder. Add the powdered sugar, 1 cup at a time, starting on on low and increasing to medium, until fully incorporated, scraping down sides and bottom of bowl as needed. Add cream, 1 tablespoon at a time, until desired consistency is reached. Scrape down bottom and sides of bowl. Increase to medium-high speed and beat for an additional 3-5 minutes until smooth, light and fluffy. Frost completely cooled cupcakes. Heat cream just until it starts to simmer and little bubbles start forming. Place chocolate (chopped or chocolate chips) in a small bowl and immediately pour hot cream on top. Let sit for 3-5 minutes and then gently stir until smooth. 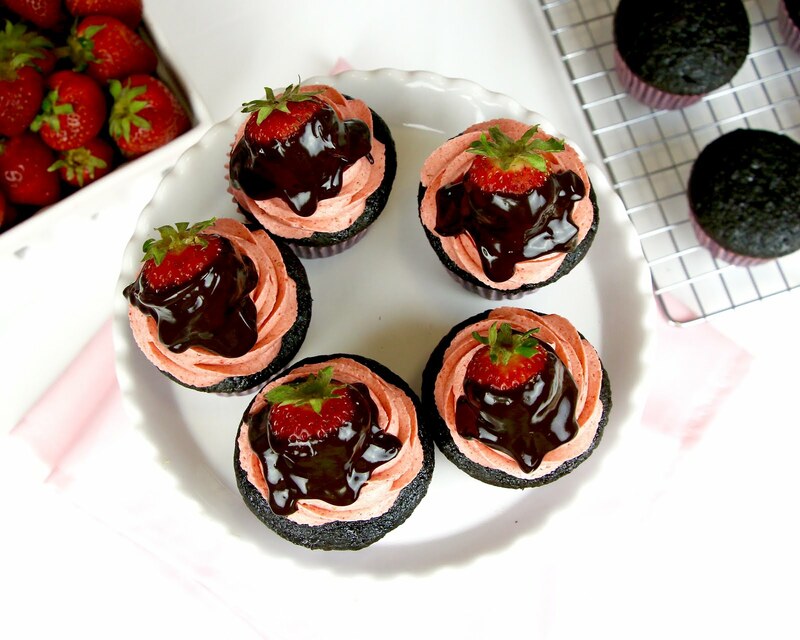 Dip strawberries in chocolate and place on top of each cupcake. Add more chocolate on top, if desired.